Every so often I keep asking myself, "What's next?" Do I continue to just practice what little biketrial skills I already know to refine them or should I start learning new skills? I get immense satisfaction from being able to learn a new trial riding skill and then honing that technique until I could do it consistently. But sometimes, it gets monotonous... LOL. Which is why, practice riding a "section" is so important... it allows me to use a combination of techniques and skills I have painfully acquired to come together in a symphony of movements that allows a rider to finish a section smoothly. In the end, I always find out that it is not the lack of techniques or skills that prevent me from finishing an imaginary "section" that I predetermined. It is rather, my physical fitness (and fear of falling) that I call to question! LOL... I watched those YouTube videos and I always wondered how the heck those trial riders do it??? Never fail to amaze me... LOL. The bench I made from the wood pallets. It was important that when I land on the bench, it will not budge or slide away. This was my biggest fear factor... LOL. Btw, I made 4 of these benches. Anyway, I have been rebuilding the wood pallet sections in my house. In my last blog post, Homemade BikeTrial Training Park, I mentioned going around hunting for wood pallets and making benches. I had been planning to refine my pedal-kick. I needed to be able to pedal-kick from one bench to another and I wanted to do it consistently (you always see those riders do it so effortlessly in the videos... LOL). Anyway, watch the following video for my attempts... LOL. I just needed to be able to do it three times. It was sort of a rule of thumb told to me by my buddy, Syarul, whom was told by Walton of BikeTrials Singapore... LOL. And so I did it three times... Hahah. 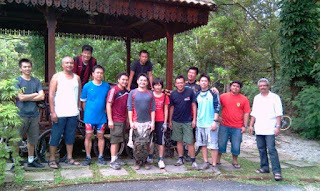 After that, two Saturdays ago, I went on a Wildgeeks cross-country riding re-union in FRIM. It was great riding and hanging out with the guys. Except for the fact that I had a pretty nasty crash... LOL. Ripped some skins off my left calf and had to get 4 stitches... no biggie, except that it was grouse to see the skin hanging there... LOL. Photo of the geeks uploaded to Facebook by the John (aka The Rooster). 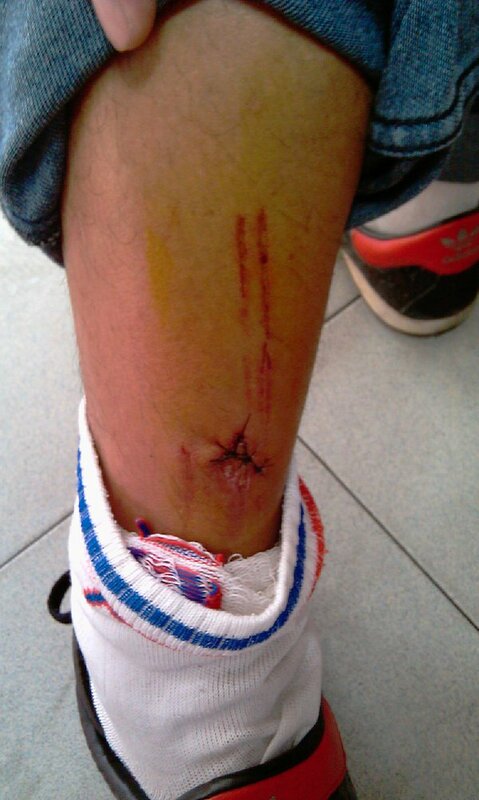 The 4 stitches... LOL. Photo by John (aka The Rooster). Btw, I told John to Twitpic my wound and say it was a snake bite... wicked! Btw, I could not helped it. I have already started riding since Monday... LOL. Yeah... and it had bled a little... why am I so stubborn! Cheers!! !